Koloale are starting from the eastern end of Lawson Tama while Solomon Warriors have the sun on their backs from the western end. 0m0s Referee Nelson Sogo kicks off the match. 5m0s After 5 minutes of play it is Koloale who are looking sharp. They almost broke through in the 3rd minute with a header from Ian Paia but he was denied by the goal post. 7m30s Joses Nawo beats Brian Feni on the right and he was heading for the 18-yard box when Hadisi Aengari deals with him quite effectively. Benjamin Totori underlines Koloale’s seriousness by keeping the pressure on Solomon Warriors but Aengari (Hadisi) stood his ground to clear the ball away. 9m0s Kidstone Billy wins a free kick after he was fouled by Leonard Olea. He goes for goal but the ball curves wide and goes out for a goalkick. 11m49s Solomon Warriors breakthrough on the left with a splitting pass from Billy which finds Carrol Kakate and he puts a shorts pass in for Dennis Ifunaoa but Olea was there to block his shot. They set up another attacking move from the same area but Bata Furai could not catch up with the return pass from Kakate. 13m09s Koloale win their fourth corner kick of the game but Totori sends it right to Aengari (Hadisi). 15m50s Kakate and Ifunaoa combine for another good drive against Koloale but the final shot from Ifunaoa was not good enough and the ball goes wide. 16m0s After 15 minutes of play score remains at 0 – 0. Solomon Warriors are coming into the game after a slow start. Koloale have lost the early dominance they had. A sizeable crowd is already in Lawson Tama but more are waiting in the long line for tickets outside the entrance gate. 17m40s Koloale almost get the lead when Fa’arodo Jnr. gets on the end of a Totori cross but his inside of the foot attempt went above the cross bar. He was in a one on one situation with the goalkeeper and his reaction says that he felt that he could have done better. 20m20s A corner kick from Nawo finds the header from George Suri and the ball makes it past the keeper but George Kwanae is able to kick the ball away from the line. 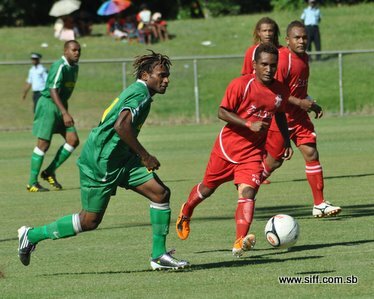 Another close shave for Solomon Warriors but their defence is still holding. 21m41s Solomon Warriors win a corner kick on the left of the field but the ball goes too far into the field and Koloale are able to push up and clear the ball away. 23m10s CAUTION: Hadisi Aengari is cautioned for a heavy tackle on Nawo just outside the 18-yard box. A free kick is given to Koloale. 24m 18s Fa’arodo Jnr. lines up the shot and the ball takes a deflection but ends up on the foot of Paia who shots only to find the cross bar again. The ball comes back into play and Solomon Warriors race up for the counter attack with Ifunaoa and Kakate but the latters was called offside and the goal from Ifunaoa was disallowed. 27m17s Totori breaks on the far side and shoots from distance but Paul Huia has the shot well covered. 28m25s Willie Daudau returns the favour on the other end of the field but the shot goes wide. 32m05s Billy lines up a free kick from 36 yards out and tries to find Abba but the Koloale defenders follow him closely and they clear the ball to safety. 34m17s Abba wins another free kick for Solomon Warriors and decides to take it but his attempt goes straight to Fa’arodo Jnr. who clears. 36m20s Koloale win a free kick right on the edge of the 18-yard box. It is dangerous for Solomon Warriors as Suri comes up to take the kick, he shoots but his attempt goes above everybody and the cross bar. It is another lost opportunity for Koloale. 38m59s Billy shoots from distance after a top class combination with Ifunaoa but the attempt just grazes the cross bar of the Koloale goal and the ball goes out for a goal kick. 39m58s Billy shoots again from a similar spot but this time it is too high. 40m0s SUBSTITUTION: George Abba is replaced by Peter Taloga for Solomon Warriors. 41m05s Billy puts in a through pass for Ifunaoa and the youngster does well to go past Francis Lafai but the shot does not go well. 42m34s CAUTION: Leonard Olea is yellow carded for repeat offences. 43m05s A free kick is awarded to Fa’arodo Jnr. 25 yards out from the Solomon Warriors goal. Ifunaoa is reacting quite angrily to the referee’s decision but apologises to Fa’arodo for the harsh tackle. The free kick is taken but the ball is blocked by Daudau. 45m0s Additional time of 2 minutes is announced. 45m + 36s Ifunaoa is set up for a shot in the box by Taloga but the post denies him. The referee ends the first half. The second half has resumed. 47m23s A promising break from Koloale is blocked out by Furai who collides with his own goalkeeper in the chase for the ball. 47m57s SUBSTITUTION: Leonard Olea is replaced by Freddie Kini for Koloale. 50m0s Both sides are going to neck to neck at the moment. It would take something special to separate them since neither is about to budge. Koloale are attacking well but they are met with a resolute Solomon Warriors backline that has kept them frustrated from the opening whistle. 56m0s Ifunaoa picks up a long pass in the 18 yard box but Lafai follows up to win the ball away from him and he clears it away. 57m24s Koloale win a free kick after a foul on Nawo. Totori goes for goal and the ball just was a few centimetres too high and it bounces off the cross bar and back into play. Koloale attack again from the throw-in but Feni is able to control and wins a goal kick. 59m08s A quick counterattack sees Ifunaoa race into the box for the shot but Lafai quickly recovers to block his shot. 68m45s Apologies for the technical problems. Play has been stopped for the Solomon Warriors goalkeeper to receive medical attention after a collision with a Koloale player. 68m50s CAUTION: Henry Fa’arodo Jnr. of Koloale is yellow carded for an offence not seen by the referee but the call came from the second assistant referee. 73m15s A corner kick is given to Solomon Warriors. Billy sends in the cross and Koloale finally make the clearance after a few scary moments in their box. 75m0s Security and police to called in to assist us an argument between 2 spectators gets heated up. Quick action from the security personnel addresses the problem. 77m23s Paia goes high with another header for Koloale but his attempt goes too high. 80m11s SUBSTITITIONs: George Suri is replaced by Gideon Omokirio and Jeffery Bule is replaced by Lency Saeni for Koloale. 83m23s Substitute Maemae tries his luck from distance but his shot goes too high. 85m12s Solomon Warriors win a free kick. Maemae tries to cross for his teammates but he sends it wide. 87m42s Ifunaoa drives in to the Koloale 18-yard box and attempts a shot but Samson Takayama blocks the shot away. 88m32s CAUTION: Omokirio is given the yellow card for his tackle on Kakate a couple of minutes earlier. 89m16s Nawo shoots from a rebound but the ball goes too high. Solomon Warriors counterattack with Ifunaoa and Kakate but Kakate steps on the ball and Takayama recovers to make the clearance. 90m0s SUBSTITUTION: Willie Daudau is replaced by Tigi Molea Toata for Solomon Warriors. Three (3) minutes of additional time has been announced. 90m0s + 1m40s SUBSTITUTION: Ian Paia is replaced by Steve Anisi for Koloale. The 2 sides will meet again on Thursday 16 June at 3:00pm in the second leg of the O-League playoffs.